According to the White House Office of Consumer Affairs, loyal customers, on average, are worth up to 10 times as much as their first purchase. So yes, customer loyalty is very important. Yes, building that trust through a computer screen is a challenging task, but definitely not impossible. What is important to remember it that it is essential for customer retention. 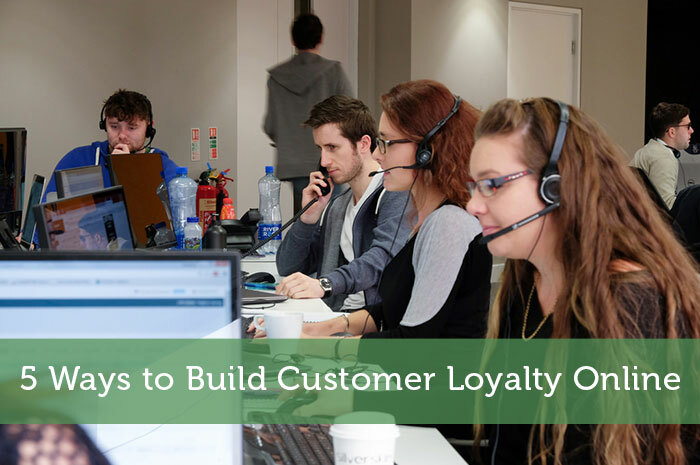 If you want those one-off visitors to convert into a one-time customer once, and are not interested in repeat their repeat custom, then maybe loyalty isn’t as vital, but this may not be the best business mode. Attracting a new customer costs five times as much as keeping an existing one, so it makes sense to try and hold on to the ones you’ve got. In the modern marketplace where 63% of people use the internet to research products before they commit to a purchase, it is more important than ever to focus on your online customers. More traditional business owners and salespeople may feel that they are missing an opportunity to connect with their potential customers with that ‘vital’ face to face interaction. As more and more of the sales process is occurring online in 2016, it can be perceived that the more ‘personal’ interaction in missing. However, there are a whole host of ways you can connect with your potential customers online, which may leave you almost relieved to say goodbye to that face to face interaction. Sometimes it may seem easier to offer your customers a quick-fire deal or voucher to keep them coming back for more- but it doesn’t always have to be that way. Clinton Njie, believes a common misconception of loyalty is the propensity to see it as a reward. “True brand loyalty is hard-earned and about more than discounts and the monetisation of the marketing strategy,” he says. A great place to start to speak to your customers is through social media. Online consumers have grown accustomed to the idea of reaching out to businesses on social media platforms of all types, and on their various devices. That being said, in a sea of brands on Facebook, Instagram, Twitter, Pinterest and Linkedin, it is not enough just to have a social media account anymore. You need to offer something in return for your customers’ trust and loyalty online. Great content matters, and that said, you want to give your target market what they want. Without content, your brand has no purpose of even being on social media. A vague content strategy will give you a great basis of when to post lighter content and when to post more in-depth content to inform your customers. Why not get a conversation started? You want engagement to establish that connection between your brand and the user. This makes your audience see your brand as more personable and ‘human’, which makes it easier for them to form an emotional connection, and keep them coming back for more. Whether it is a live chat option on the site or a 24/7 contact or support phone number, you want to make sure your customers feel that you have their back. There is nothing worse as a customer than having an issue with the checkout process or a specific product request and feeling that you have nowhere to turn. This can affect the legitimacy of your company in the eyes of those who matter most. You want to appear transparent and trustworthy throughout the sales funnel, and every sales funnel your customers face there onwards. Giving your customers an option of how they can part with their money is putting the trust back in their hands. Whether it be instalment plans or a single payment, (if this model is viable for you as a business), it would be beneficial for your customer retention to test these options. Everyone likes to have choice, and the opportunity to be in command of their own funds. In addition to this, give your customer the option of how they make these payments. Whether it’s Paypal, Visa, etc., a recent study has found that 73% of online consumers would prefer to see several payment options when making online purchases. Don’t bully your customers to come back to your website with repetitive email campaigns which will pester them to the point of a negative association. An optional customer loyalty program is a way to increase conversion from current customers. This scheme should incentivise the customer and provide them with exclusive rewards as a thank you for their loyalty to your brand. Something as little as money off their next purchase or targeted discounts based on their shopping habits, can personalise the experience and ensure customers return willingly rather than being harassed with emails in their inbox they would rather not read. It is one thing having an excellent sales temperament when your customers visit you in store or when they call you but you can make your website and company say things about you and your business that you cannot get across in a short chat in person. Appeal to your target market’s interests and pains. What do they care about? By supporting an important charity or non-profit organisation, you can say a great deal about what sort of business you are running. In this way, you are appealing to your target market’s heartstrings at the same time as supporting a great cause.